It is suppose to work rope to rope. Monohull sailors use it to release pressure on a sails sheet while fixing a fouled wench. I don't have any experience rope to rope.though. 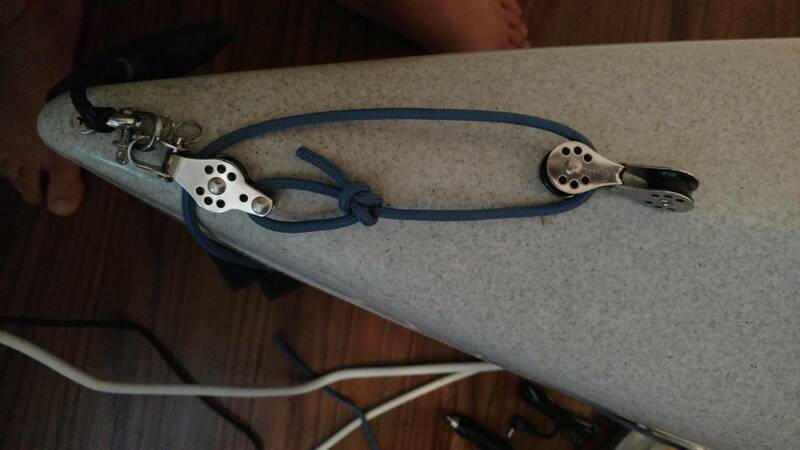 A prusick knot might be better for attaching the soft shackle to the "traveler" rope. Boom hitches would be good on each end of the "traveler" rope on the aka. Put the Spinnaker to use today, blue halyard line keeps getting caught. Had to sheet in for pull the Spinnaker into the bag. There must be some mod to extend the blue halyard line going to the top mast. It needs to be extended to stop it getting caught. TI_Tom, interesting knot, I'll check that one out. T84, can elaborate" is you blue line wrapping around the mast when you furl the main"
I have solutions but even with these I occasionally snag the lines. 1. Cut the top batten down almost flush with the sail. 2. Try adjusting the tension on the upper batten. For me, loose was better. 3. 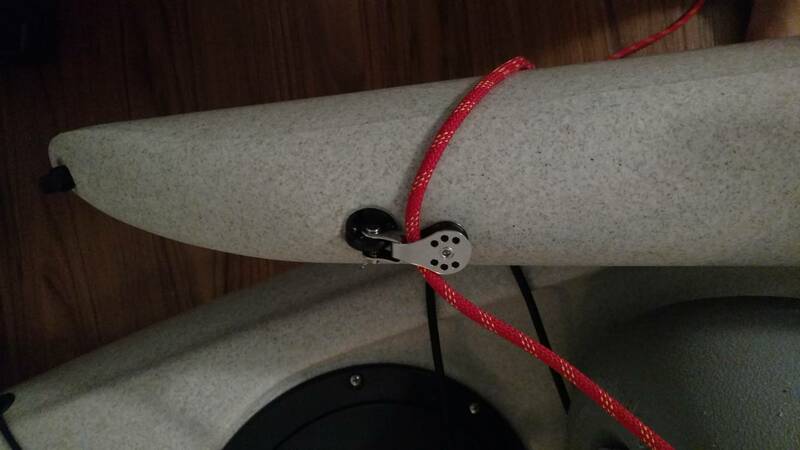 Zip tie a 4 foot pice of shark tubing (find at Home Depot) to the mast topper and run blue halyard line through it. 4.. And then most inportantly, learn to furl slower. You can almost always avoid the snag with a slow furl. Hard to remember in wind gusts or emergency. As Tony says, look up when you furl. 5. Practice unsnagging with out demasting. Do it in the driveway BEFORE you hit the water. Most unretrivable snags can actually be reduced with patience and finesse. Would love to hear what others have done. Tom, I tried the Prusick knot and the boom hitch on rope to rope. Both performed very well. I found the Prusick to be much easier to remember how to tie though. Nice knot. Just bought some more pulleys and cheeks blocks. I think this will lessen the tension on the blue halyard line and make it easier to pull the sheets with less effort. Also by using the pulleys on the rear aka, I can now remove the eyelids that the Spinnaker kit provided. With the eyelids installed, I could not fold my rear aka support arm in. I also did not want to use the stock padeyes that is supposed to keep the blue halyard line from getting stuck underneath the aka bars. I think the padeye will chafe the line and eventually destroy it. Looks good. My only concern is using the top hat to attach the block. It would probably be more secure with a prusick or boom hitch between the top hats. 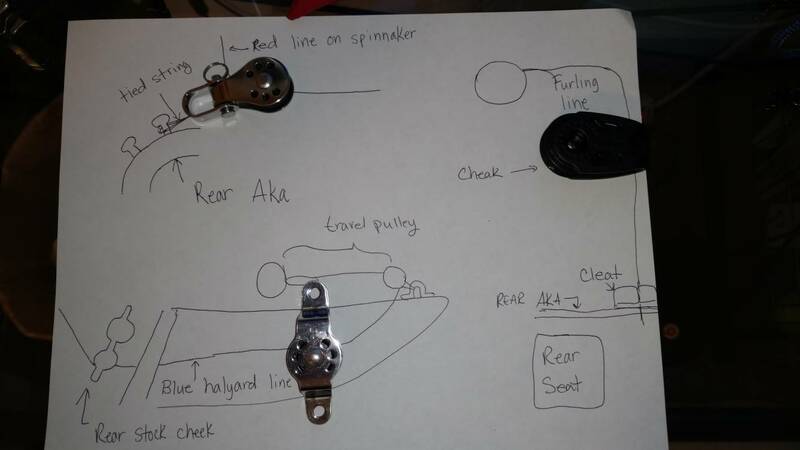 The prusick would be my choice because you already start with a loop that can be run through the swivel on your block. I'm having issues with my Spinnaker not going inside the snuffer bag. It gets stuck right by the mouth of the bag. Any ideas? It's probably the patch that the snuffer line runs through. It'll soften up over time. I just bought a spinaker for my TI and installing it now. Every thing I'm dooing is tempoary to see if i'm satisfied. First lashed 2 pullys at the ends of each rear AKA. Then run 1 rope from one pully to the other to form a figure eight and tie the ends together. Then attach a 2 soft blocks using a prusik knot to the looped rope near the ends of each AKA. Attach a zigzag cleat to the X-bar. Run your sheet through the soft block and through your sheet cleat. You are now able to move the soft blocks in and out. Using the zigzag cleat to secure the loop. The reason for the figure eight is so both blocks move in together and out together at equal distances and totaly adjustable. It also will keep the AKA's from pulling out. This is all theory and hope it works. Sweet! Let us know how it works out. I removed the stock pulley kit that the travel pulley line goes in on the bow from the Spinnaker kit and replace it with a micro block. The lines are a lot smoother now when pulling up the Spinnaker sail. Instead of using the pad eyes on the aka, I ran it to the back of my ama. I have no problems of the lines falling off now into the water. I'm new to sailing in these small craft, all my experience is on large mono hulled sailboats, I cut my teeth in the 70's as a deck hand on a 1927 63' ketch, the smallest sailboat I've sailed is 33'. What I'm getting at is why is this sail called a "Spinnaker" it's more of a hybrid jib. Is it because it's not attached to a forestay? Thanks for your help.